Extra Specifications: New in box. 3 year Warranty. Model Description Price Call today! The Picotest PDN probes are 50 ohm transmission line probes. These precision 1x probes support a variety of measurements including impedance (1 Port Reflection and 2 Port Series and Shunt thru), step-load, ripple, noise TDT/TDR, PCB resonances, clock jitter and non-invasive stability. They have some significant advantages over active probes and other types of passive probes. The 1-port probe, being a unity gain wide bandwidth probe, allows the measurement of ripple and noise with optimum signal to noise ratio (SNR). The 2-port probe can be used to transmit a load current step through one port, while measuring the response from the other port, simultaneously. 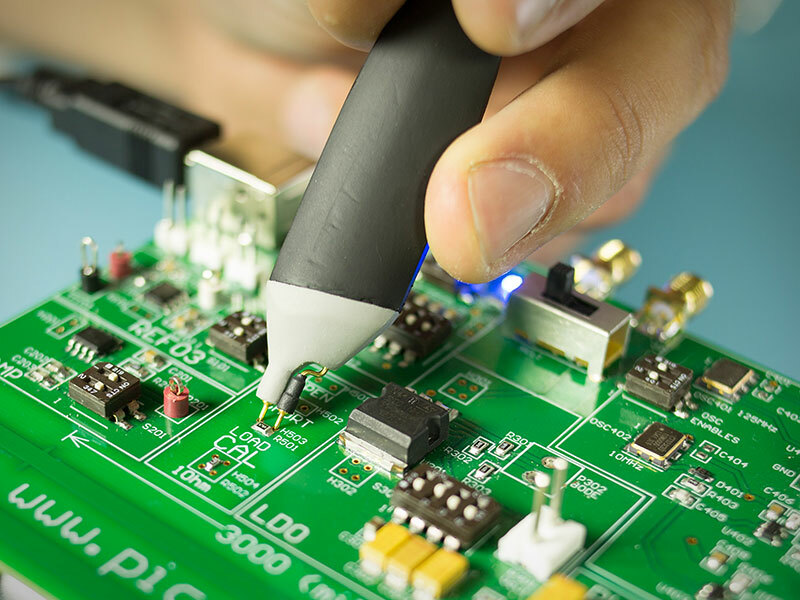 The probes can both be used to inject noise for the assessment of sensitivity to the power supply for sensitive circuits such as clocks and LNAs. The probes are supported by a wide range of signal injectors and accessories, such as DC blockers, preamplifiers, and high speed current injectors. The high-bandwidth (DC-1.3GHz), variable-pitch probe tip design enables accurate impedance measurements for high-speed PCB development and manufacturing. It eliminates the need for soldering SMA cables to your board and the risk of damaging fine copper pads or pulling up small components. You can get connectivity to circuit boards and devices without connectors. 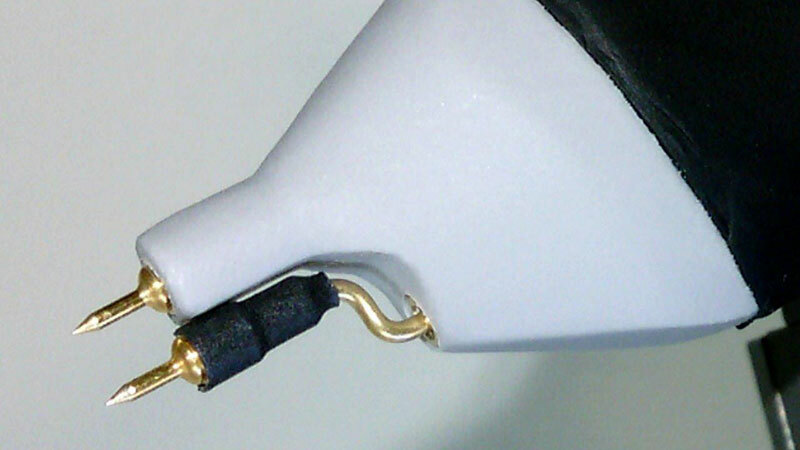 The probes are compatible with all equipment including VNAs, oscilloscopes, and spectrum analyzers and come with an accessory kit (see above photo) that includes a variety of probe tips and lead extenders, as well as, a DC blocking device. The probes are also designed to work with the Picotest J2180A low noise preamplifier to improve signal to noise performance and the J2102A common mode transformer which eliminates the DC ground loop. Transmission line probes are a special type of passive probe that replaces the high impedance probe cable found in a traditional passive probe with a precision transmission line, that has a characteristic impedance that matches the oscilloscope?s input (50Ω). This greatly reduces the input capacitance to a fraction of a picofarad, minimizing the loading of high frequency signals. The probes are referred to as ?PDN? probes, because of their effective use in measuring the low and ultra impedances found in power distribution networks. The input impedance of the Picotest probes remains nearly constant over their entire frequency range. A traditional ÷10 passive probe has a high input impedance at DC, however, this impedance drops rapidly with frequency, passing below the input impedance of a transmission line probe at <100MHz. The probes are useful in applications that produce fast rising, narrow pulses with amplitudes which exceed the dynamic range of active probes. They also tend to have less parasitic effects on frequency response and so they are ideal for measuring impedance. By providing a simple yet elegant solution to probing high-frequency signals, Picotest?s one and two port transmission line probes preserve signal fidelity and allow high-bandwidth test equipment to properly measure circuit characteristics. High speed applications put pressure on the measurement of power supply busses to unprecedented frequencies. As an example, the measurement of power distribution network (PDN) impedance for FPGAs generally requires the measurement of impedance levels in the milliohm scale at frequencies exceeding 1GHz. Measuring the high speed step load response in power systems using 2-port impedance is difficult because of the need to connect two 50Ω transmission lines to the output capacitor. Compounding this difficult task is that these measurements often need to be made in very small circuits such as cell phones, solid state disk drives, and computer tablets; to name just a few examples. These revolutionary probes alleviate many of these challenges while maintaining the precision 50Ω characteristics required for these types of measurements. The specifications are subject to change without notice due to design improvements.